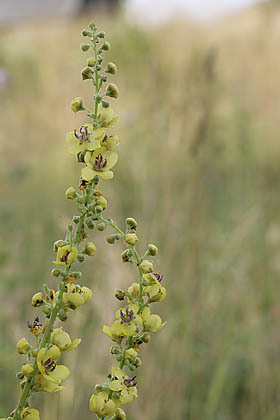 Dark mullein is conspicuous from far away, because of its height and the long, brightly yellow inflorescence that sometimes makes up half of the total length of the plant; it can grow into a plant of one and a half metre. Habitats are roadsides, river banks and open and not too wet areas in general. It isn’t a long-lived plant, grows as a biennial or for a few years in the same spot. The stem of the dark mullein is reddish and furrowed, leaves are dark green, covering the stem rather sparsely. The delicate and easily dropping flowers have stamen filaments covered with long violet hairs. Dark mullein is toxic, not to humans but to insects. So we could test a natural and relatively safe insecticide. In fact, interesting and would need testing: would it stop the invasions of ants in houses?